Area: 252436 sq km. Location: The Brooks Range is located in northern Alaska, north of the Arctic circle. It separates the oil-rich Arctic Ocean coastal plain from the Yukon River basin. An oil pipeline was built across the range in 1977; it begins at Prudhoe Bay in the north and extends to the port of Valdez, in S Alaska. The northern slopes are drained by a series of big rivers. The rivers, from west to east are the Coville river, Kaparuk River, Canning River, and about 2 dozen smaller rivers. Within the Brooks Range are numerous smaller ranges such as the Schwatka Mountains, Endicott Mountains, Philip Smith Mountains, Romanzof Mountains and Davidson mountains. A huge chunk of the eastern section is set aside as the The Arctic National Wildlife Refuge. Terrain: The range is entirely above the Arctic circle. The elevation of the peaks in the range averages around 2,000 m, rising to over 2,500 m in the extreme northeast. The higher slopes are snow and ice-clad for much of the year, and they drain into icy rivers which flow into icy seas. Wolves, moose, and a 160,000-strong porcupine caribou herd roam the uplands of the range. North of the range is the arctic coastal plain, which stretches to the Arctic Ocean. 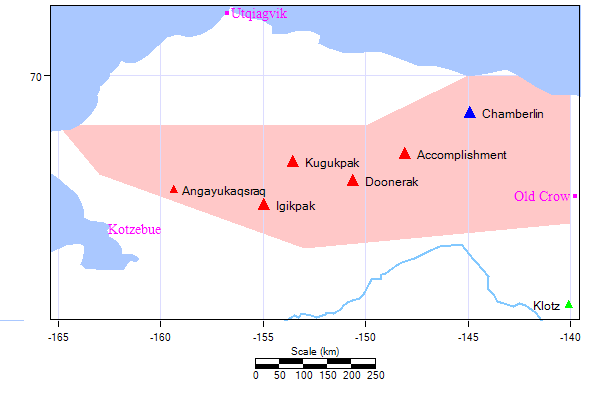 It is a region of tundra climate and has weeks of continuous darkness in winter and of continuous daylight in summer. Moderated by ocean influences, the winter is somewhat less harsh here than in interior Alaska. While the snow cover is thin, strong winds at times create extremely cold wind-chill temperatures. The average annual precipitation is less than 200 mm (less than 8 in).